Where to get your St. George ribbon to mark Victory Day? Drop into these places in the U.S., UK, Canada, and Latin America! 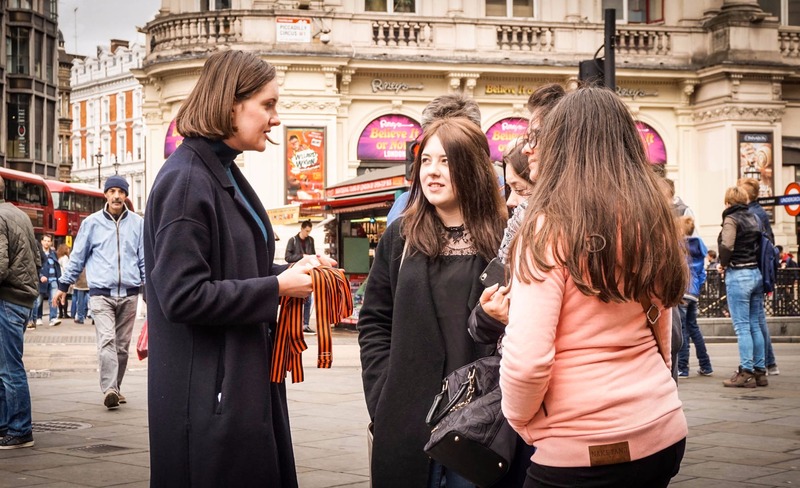 St. George Ribbon campaign in London, April 25, 2017. The St. George Ribbon campaign was launched on April 24 in the run-up to the 72th Victory Day celebrations. The public holiday, which started in the spring of 2005 in Russia, quickly gained popularity and has become a global event. This year the campaign will be held for the first time at the Rossotrudnichestvo offices in Afghanistan, Makedonia, and Montenegro, said Deputy Head of Rossotrudnichestvo Alexander Radkov – RIA Novosti reports. According to him, the large-scale "George ribbon" action will also be held in Washington DC and New York. Canada has joined the campaign while Argentina, Brazil, Nicaragua, and Cuba will also take part. “This year, we sent more than 100,000 sets of St. George's ribbons abroad,” Radkov said. The St. George ribbon can be picked-up across Russia and in almost 90 countries around the globe until May 9. See all places at the Rossotrudnichestvo web-site.